A while back, I purchased a model rocket kit and its parts. During my time in Sudbury, Ontario, from August 1 to August 23, I built the rocket. It was a tall, slender rocket and it was built with care. I hoped to launch it before I returned to Toronto. August 21, 2014, despite a forecast of rain and overcast, turned out to be a beautiful day. The clouds were scattered and fluffy, and the sky had a strong blue tint to it that day. It was a good day to launch a rocket into the atmosphere. My dad did a lot of work to make this launch a success. He built the launch pad using a dull pink, circular, concrete slab, drilled a hole into it and placed a steel rod through the hole. Its design was to keep the rocket straight. If it wasn’t straight, it would be flying at an angle, and likely hit the ground and cause a fire. That was a bad idea under the scorching heat of summer. While my dad built the launch pad, I prepared the engine for launch. It was a cylindrical cardboard box filled with a series of solid chemicals. When ignited, it should burn through the series of chemicals and then the parachute will land the rocket safely on the ground. The first chemical it will burn through is the propellant. For smaller rockets, it is made of black powder, or gunpowder, which had been used in early firearms. After the propellant has been burned, it ignites the delay charge, which delays the ignition of the recovery system. During that time, the rocket will coast all the way to the highest point in its flight, and then begin to fall back to the ground. The delay mechanism will then ignite the ejection charge, which will push the parachute outside of the nosecone, and deploy the parachute. If all goes well, it will launch, deploy the parachute, and land safely on the ground. I quickly attached the metal leads onto the rocket nozzle, keeping it in place with a plastic peg. I then slipped the engine into the rocket, and set the rocket aside. With the construction work over, we decided to search for a good launch location. Launching just outside our home would run the risk of causing damage to my neighbours’ property. We decided to launch at the bottom of the cliff. There, we can have family members with a bird’s eye view of the launch, and we would be far away from anyone’s property. The launch location we picked was on top of a sand deposit, left behind by ancient glaciers. It’s the same kind of sand that can be found on beaches. Plant life has since taken over, but it’s empty and wet enough that a fire is unlikely. It was the perfect spot. When we arrived at the launch spot, we unpacked all our equipment, including a shovel, a jug of water, and a fire extinguisher. My dad placed the launch pad, and leveled it accurately. I carefully slipped the rocket into the steel rod, making sure nothing broke. I turned the circuit on, and stuttered “IGNITION!” At that moment, the rocket ignited. It flew into the late afternoon sky, disappearing in a sea of blue with only a white smoke trail left showing the flight path. After a few second, I saw it in the sky. The nosecone was just ejected and the parachute had deployed. Unfortunately, it didn’t fully deploy. It fell down faster than expected. After a minute of worry, it landed by a bunch of trees. My dad and I quickly ran to the landing site. Thankfully, we found the rocket undamaged. The parachute had been tangled up in the mix, which is why it didn’t fully deploy. That will be a problem to correct later. We brought the rocket and all of our equipment back to the car. We also dumped the water into the sand. We returned back home with our video footage, and equipment. It was a successful experiment; we launched the rocket, and got it back with no damage to the body. Despite the parachute tangling up, the rocket launched and the nosecone ejected without any problems. I hope to be able to launch again with larger engines, and go higher with that rocket, and maybe build bigger and faster rockets in the future. The sky is never the limit in rocketry. During the night of August 7-8, I saw the moon in a way that is rarely seen. The moon was a bright orange-red colour in the night sky. At the same time, there were very little stars visible in the night sky, for some reason. It was quite perplexing why, but I decided to not worry about it and to focus on the Moon that night. Many months ago, I was working on RASC’s (Royal Astronomical Society of Canada’s) Explore the Universe certificate program. My progress with the certificate stagnated for a while, and after realizing that I didn’t document when and with what I saw each celestial object with, I learned that I cannot use my current observations towards my certificate. Therefore, I had to start over again. It was heartbreaking to start again after working hard to find and observe those objects. Despite that setback, I found a great opportunity to view this strange, yet beautiful moon. 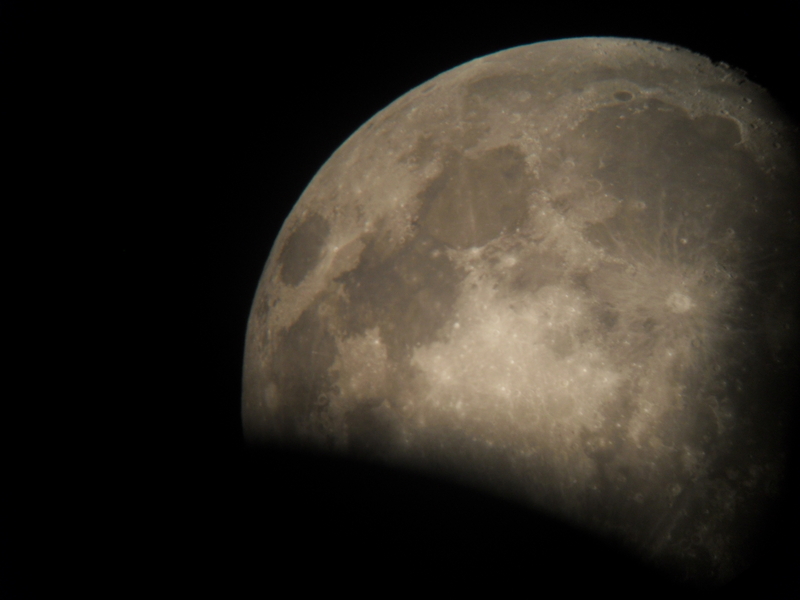 I quickly aligned my telescope to the Moon and I began looking at the features of the Moon. Last time I explored the Moon’s surface features, the moon was a waning crescent, which made it difficult to find all the surface features (mares, and craters) necessary. Here is a link to the previous blog post chronicling that night. During this night, the Moon was coming very close to its full phase, which meant that more surface features were visible and it would be easier to find them. Since I had done this before, it was easy to find the mariae I found during my previous search, such as Oceanus Procellarum, Mare Insularum, and Mare Imbrium. I also found Crater Copernicus and the Crater Plato. After finding those mariae and craters, I went on to find other features that were in the dark side the last time I observed the Moon in its waning crescent phase. 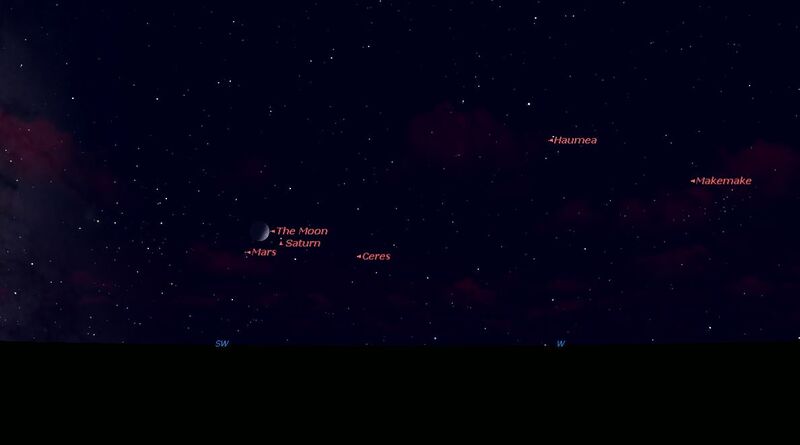 Here is an interactive map of the Moon to follow. On the Moon, beside Mare Serenitatis is Mare Tranquilitatis, where Apollo 11 first touched down on the Moon. I then found Mare Crisium, which is located North-East of Mare Tranquilitatis. It quite perplexing how all the Mariae’s regolith contrasts with the regolith surrounding the mare. From my research, I learned that the formation of the Mariae started 3.9 Gyrs (Billion years) ago. At that time, the Moon’s crust had solidified and was being bombarded by many asteroids. Then there was a large volcanic event which flooded the plains with magma. It’s unclear why the mariae are concentrated in the near side but one theory suggests that the near side’s crust is thinner than the far sides, which made it easier for volcanoes to erupt at the near side. Another theory suggests that since the Earth and the Moon were closer to each other (10x closer) when they were formed, the hot Earth heated the near side, which delayed its cooling process. Whatever the reason, I’m glad humanity has the opportunity to see the mariae. After finding many mariae, still not finding enough of the mariae on the list, I went back to Mare Imbrium to look for other mariae. I soon realized that north of the Plato crater there was Mare Frigoris, also known as the Sea of Cold. Looking at my list, I found the required number of mariae on the list for the certificate. I then moved onto finding the required numbers of craters. It was considerably harder to find the craters on the Moon as most craters, unlike mariae, are not as recognizable, however, I was up to the task. After finding Crater Copernicus and Crater Plato, I found Crater Kepler, which was not on the list. I then found Crater Tycho, which looks similar to Crate Copernicus. In my previous attempt at looking at the Moon, Crater Tycho was hidden in the dark side of the terminator, which divided the Moon between the illuminated and the unilluminated side. I then found Crater Aristarchus, which was also not on the list. After finding that crater, I was able to find three more craters to complete the requirements of my list. They are Craters Ptolemaeus, Aristoteles, and Posidonius. After finding Crater Posidonius, I finished most of the lunar requirements of my list. It felt great to finally start that certificate again. Since the night sky was so hazy for some reason, I wasn’t see anything else, and as a result, I decided to pack up my equipment and bring it back to my house. It was a successful night of observing. I saw a beautiful red Moon, and identified many of its features. One thing that made today unique was the hazy red moon. After some research, I realized that the moon was red because of the smoke from the Northwest Territories Wildfires moving down towards Ontario. It was intriguing how events far away can effect us back home. From August 1 until August 20, I will be observing the night sky in Sudbury, Ontario. There, I hope to be able to do more astronomy and see more celestial object there. On Friday, August 1, 2014, late at night, it was a clear night in Sudbury, and I decided to take my scope out that night. 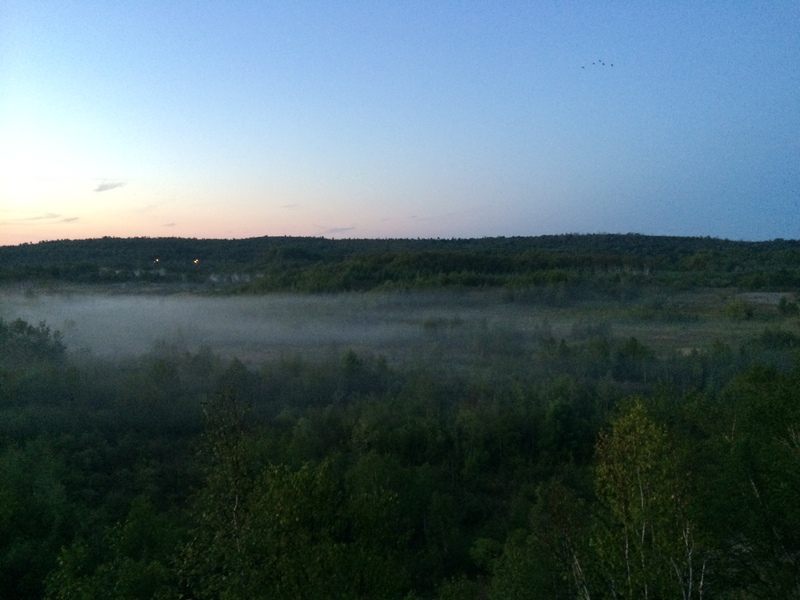 In Sudbury, the sky was much clearer than at my house. It was much clearer than the sky back home. For the first part of the session, my dad was with me. While we were beginning to set up our telescope, we saw an artificial satellite high in the sky at 11 pm. 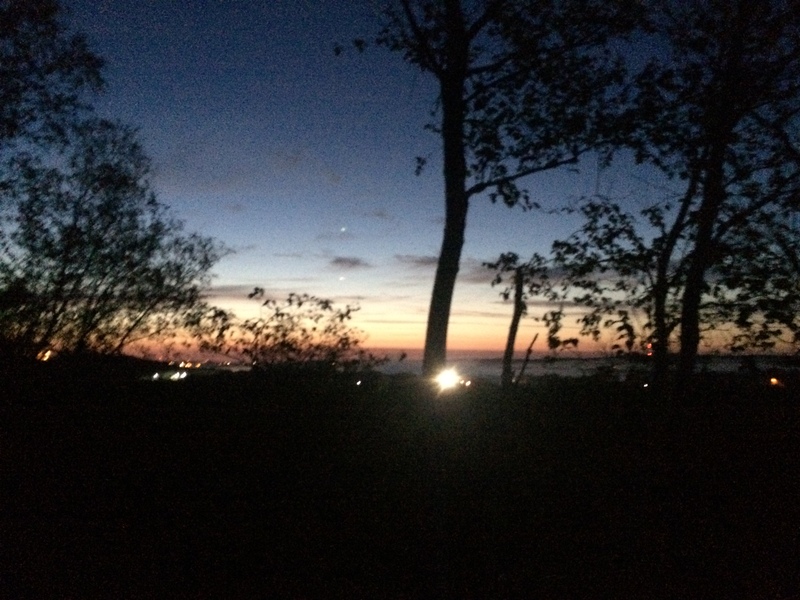 It was bright enough that it looks like one of the stars. Probably at magnitude 2-3. It was moving from the Southwest towards the North. I couldn’t figure out what the satellite is, but I do know it is not the ISS. After researching the night sky on a program called, Starry Nights, I suspect it is a satellite called, Cosmos 1536, but I can’t be sure. Cosmos 1536 is a Soviet satellite that was put into orbit in February 8, 1984. It’s perigee is 557.8 km and its apogee is 576.0 km. It takes 95.9 minutes for the satellite to make one orbit. It was used as an ELINT (Electronic and Signals Intelligence) satellite to intercept signals that are not commonly used for communication. 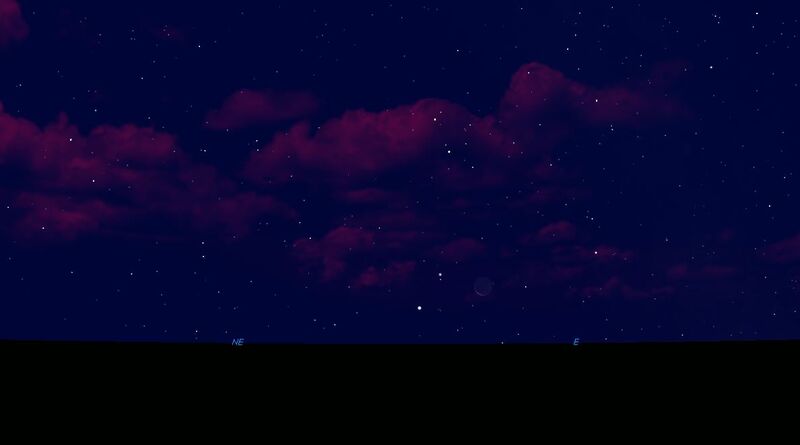 The night sky at 11 PM EDT simulated by Starry Nights ™. Ecliptic is displayed in green dashed line. Cosmos 1536’s path in the night sky is the blue line. After it disappeared in the night sky, we decided to continue setting up the telescope. Once it was set up and aligned, we pointed it to Saturn. It was beautiful as always, with its rings shining prominently. As we looked at Saturn, my dad decided to call it a night. He went inside to sleep, as he had an early morning that night. I then continued to look for other celestial objects to look at. Since I was in darker skies, I decided to look for Deep Sky Objects (DSO’s). However, that didn’t work out as I was not able to see any DSO’s. I tried to look for M51, Cassiopeia A, and other objects, but that didn’t work out. Looking at a light pollution chart a few days later, I realized that Sudbury’s level of light pollution blocks out most of the DSO’s in the night sky which was disappointing. After realizing that there are no DSO’s that I could see, I decided to call it a night. That night was quite successful. I saw an artificial satellite that was not the ISS, and I saw Saturn. It was unfortunate that I wasn’t able to see any DSO’s. Hopefully I can find them another time. Happy Observing! It was a semi-cloudy night on Friday, July 25, 2014. That night, I met my friend, Araz Boghossian, who is a photographer, electrical engineer, and amateur astronomer, in King City. Using his vehicle, we went to a lake near his house. Before we parked, a man that was there questioned why we were there at this location. We explained to him why we were there, and was all right with it. We quickly unpacked all our equipment and got it assembled. It was a good location, but since it was near a lake, it was infested with large mosquitoes, hungry for human blood. I had a mosquito repellent clip-on, but it didn’t work (I later learned I didn’t set it up right.) 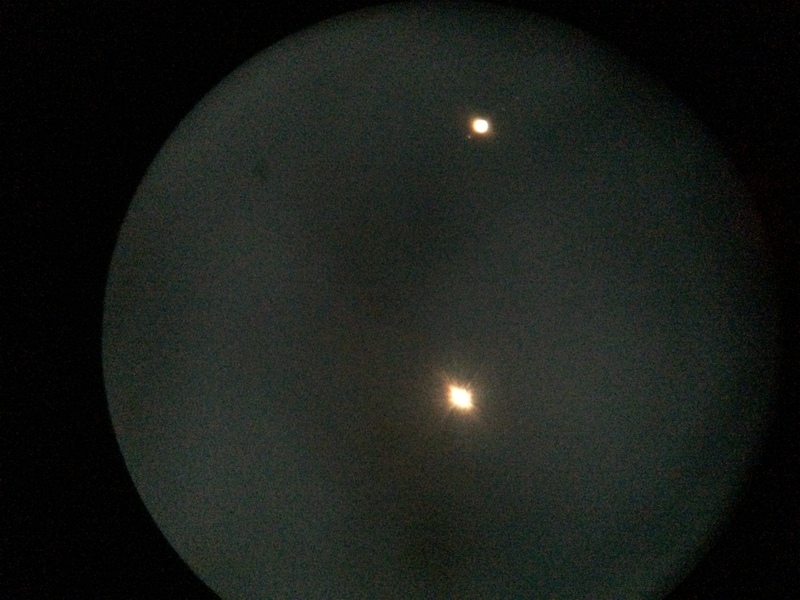 There, I was able to use my new equipment, such as my new flip mirror, which allows me to connect two devices into my telescope, such as an eyepiece or a camera; and my DC adapter, which lets me connect the telescope to a car adapter to run the telescope off its power supply. We did a lot of astronomy there. We first aimed at Mars. Since it is moving away from opposition, it didn’t give us much detail, and we quickly moved onto Saturn, swatting mosquitoes at the same time. Once we had Saturn in view, we had a look at the beautiful, ringed Saturn. When Araz saw Saturn, he was awestruck by its beauty. We kept looking at it, and we noticed three of its moons glowing dimly in the telescope. It was quite amazing and surprising that we were able to see three of its moons. Using Araz’s camera, we decided to take a few pictures of Saturn. Araz, fighting the bugs around him, quickly got his Nikon DSLR camera, switched his lens with his T-ring so that he can put it in my telescope. Once it was firmly attached, I flipped the mirror. 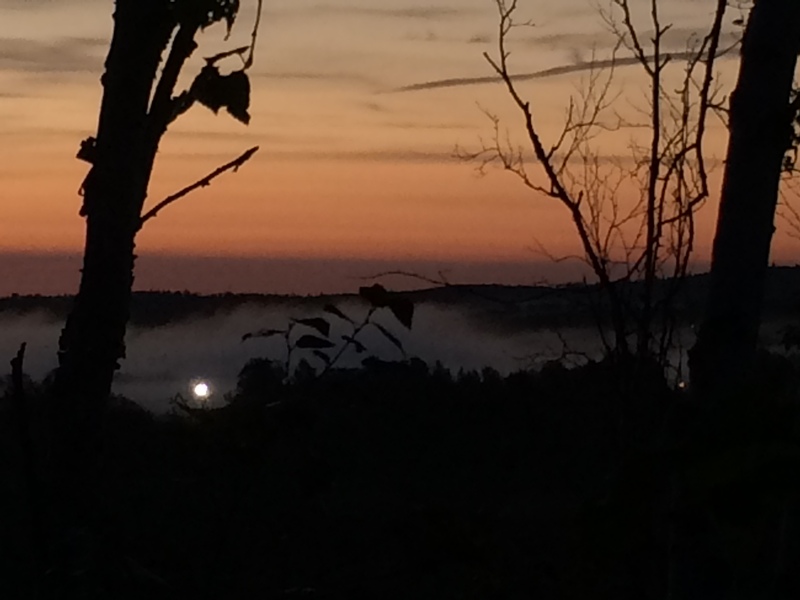 Initially, there was no image, however, we quickly realized that it wasn’t focused properly to the camera. The eyepiece and the camera require different focusing, which meant we couldn’t see using the eyepiece and the camera at the same time. Fortunately, we were able to get Saturn in view of the camera. Once Saturn was centered in the camera, we were able to take many photos. The first few were relatively blurry, but as we played with the focusing, the clarity improved. Eventually, we were able to get a great set of images of Saturn, which clearly showed the gap between the planet and the ring. It was beautiful. After a good imaging session, we decided to move onto M51, a galaxy I have yet to find. After, unsuccessfully, trying to find it among a sea of stars, we decided to try taking some images of the night sky itself. Therefore, Araz removed his camera from my telescope, replaced the T-Ring with his 18 mm lens, and left the shutter open for a long time. He was able to take some star trail images, which meant that the camera wasn’t moving with the Earth’s rotation, as a result, it captured the movement of the stars in the night sky. He showed me the pictures, and the images were well captured. At the same time, I was still looking at Saturn, and it was still shining beautifully. After his long exposure images, we decided to try and take a long exposure image on my telescope’s piggyback mount. We tried to take a picture of the Big Dipper, which didn’t turn out as we hoped. The image we took was more of a star trail image than an image of the Big Dipper. This meant that my telescope wasn’t properly tracking the night sky. I would need to get my telescope repaired. After that, we decided to call it a night. We packed up our equipment and headed back home. It was a great night. The sky was clear enough to view the planets and the stars with. Waking up the next day, I was covered in mosquito bites. Nevertheless, it was a great experience. Hopefully, the next time Araz and I meet, we will have more targets to search for, and my equipment will finally begin to work better. August 2: Mercury and Jupiter will be in close conjunction. Both planets will be 0.9 degrees apart at 19:00. August 4: The Moon will occult Saturn, which will be best viewed at Australia at approximately 10:31. August 10: The moon will be at its closest for 2014 at 17:44. It will be 356,896 km at perigee. This will be the second Supermoon for 2014, which will reach the full phase 27 minutes after perigee. August 13: The Perseid meteor shower will peak at approximately 4:00. It will be best viewed in the Atlantic region. However, there will be a 17 day old waning Gibbous Moon that will be obstructing the view. August 18: Venus and Jupiter will be in conjunction at 5:00. This will be the closest conjunction of and two naked eye planets in 2014. They will be 15 arcminutes apart, which is rare. August 25: The Moon will be in its New Phase. This will be the best time to view any Deep Sky Object. August 29: Neptune will be at Opposition with the Earth. This means that it will appear its largest and be at its closest to Earth. However, since it is quite far away, it will be a tiny dot in a sea of stars. It will be at 14:00 at magnitude +7.8, which is quite dim. Have your best telescopes ready for this! August 31: The Moon occults Saturn at approximately 18:59. It is best viewed in Africa or in the US, but it will be during the day at the US.